You may have heard the term "Region Free" used in connection with DVD players and you probably understand that such players allow you to view DVDs from other countries. But how exactly does it all work and what features make up a true international, region free DVD player? 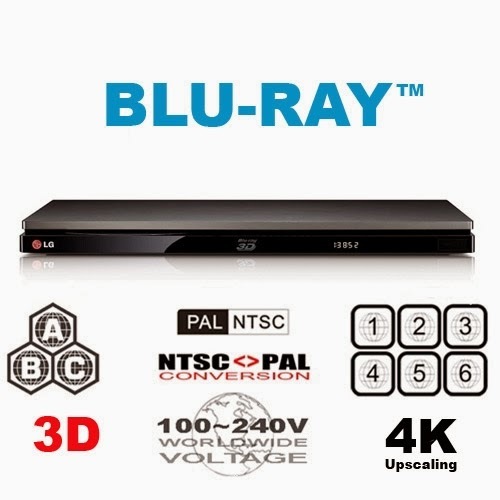 To understand the basics, we need to cover three areas that potentially affect an international DVD player, and those are the DVD regions, the video standards PAL and NTSC and lastly, voltage. The world has been divided into 6 DVD regions, with each one being assigned a number to more easily identify it. The U.S. and Canada have been assigned Region 1, while Europe has been assigned Region 2. All DVD players as well as recorded DVD media sold within a Region reflect this. So for instance in Region 1 all DVD players and all recorded DVD media are Region 1 units and they work perfectly with each other. However if you attempt to view a DVD movie from a region different than the player, the movie will be blocked. The only exceptions are DVD movies or media labeled "Region All" which will play on any DVD player regardless of Region. The only way to circumvent this restriction is to purchase a region free DVD player, which is basically a unit that can read and play DVD media and movies from all regions. This is particularly desirable if you live overseas and can't purchase a particular movie locally. The only option would be to purchase the movie from outside your region and view it locally in a region free DVD player. Before DVD regions the worldwide video standards were PAL and NTSC. As in DVD regions, units from one standard will not work with units from the other standard. In the U.S. the video standard is NTSC while most of Europe utilizes PAL. An NTSC DVD player will not work with a PAL television and vice versa. So when you're purchasing a region free DVD player, it must either be PAL / NTSC compatible or it must have the same standard as the TV you plan to connect it to. Fairly simple, but getting it wrong will get you a DVD player that will be worthless in your target country. Voltage is the last hurdle that must be crossed to find a truly region free DVD player. As we all know, voltage worldwide varies from 110v to 240v. Plugging in an electronic component with the incorrect voltage will either not work at all (voltage is too low) or will damage the electronic component (voltage is too high). To solve this issue international components have a switch which allows it to work in the 110 volt range or the 220 volt range. Don't forget though that you will probably need a simple outlet adapter (no voltage) which will allow you to physically connect the DVD player to the local electric outlet. That's all there is to it. A truly international region free DVD player will work with all regions and should also be fully NTSC / PAL compatible. Plus of course, it should work with either 110 or 220 volts. Bombay Electronics specializes in Region Free DVDs and offers models from world class manufacturers such as Pioneer, Samsung, Panasonic and Sony, amongst others. Please feel free to contact us and we'll be happy to find the perfect Region Free DVD player to suit your needs.